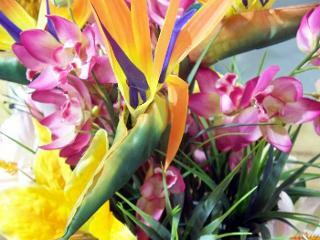 Decorate outdoors with tropical flowers. Outdoor party themes can be used for all kinds of parties, from barbecues to family reunions. Choosing a great theme can add fun to your party and also make the planning easier. When the weather gets warmer, holding parties outdoors just comes naturally. Gatherings in the back yard, at the beach, or even at a campsite seem to be simpler and less stressful to plan. Deciding on a theme for your outdoor party gives you guidance for everything from the decorations to the menu. How Should I Decorate My Backyard for a Black Light Rave Party? Ask guests to wear tropical shirts. Provide real or artificial leis for each guest. Decorate with lots of splashes of color, including flowers and fresh fruit. Motifs for decorating can include tropical fish, parrots, surfboards, grass skirts, and sea shells. For games and activities, plan a limbo contest, send guests on a treasure hunt, or have kids make their own leis. Plan a menu that includes lots of tropical fruits, seafood, jerk seasoning, and of course, rum punch for the adults. Pineapple juice or virgin cocktails would be perfect for children or those who don't want alcohol. Use floral prints for napkins, tablecloths, and other décor items. Decorate with a variety of fresh flowers and greenery. Place candles in plain or decorated terra cotta pots. Make place settings by writing each guest's name on pretty paper and clipping it with a clothespin. Secure the other end of the clothespin into a small pot filled with soil. Serve finger foods like dainty sandwiches and cut fresh vegetables, along with hot and iced tea. Don't forget the small squares and cookies for dessert! Activities can include making flower arrangements, decorating plant pots, and even planting seedlings. Decorate with pennants and flags from different professional or local sports teams. Set up lots of different games to play, like a putting green, a badminton or volleyball net, and areas to play soccer, lawn bowling, and horseshoes. If you have a swimming pool, plan races or pick up a floating basketball net. Serve typical tailgate fare like hearty meat on buns with all the trimmings, potato salad, and chicken wings. Beverage choices should include sports drinks. Make sure you leave enough time for guests to cool down between games, and offer plenty of water to drink. It also helps to have a large shaded area with chairs for guests to relax in after working up a sweat. From wild pool parties to quaint tea parties, you'll be able to find a suitable outdoor theme that will encompass the decorating, food, and activities. Use your imagination to come up with more ideas which will suit your guests and the occasion, as well as the location of the gathering.